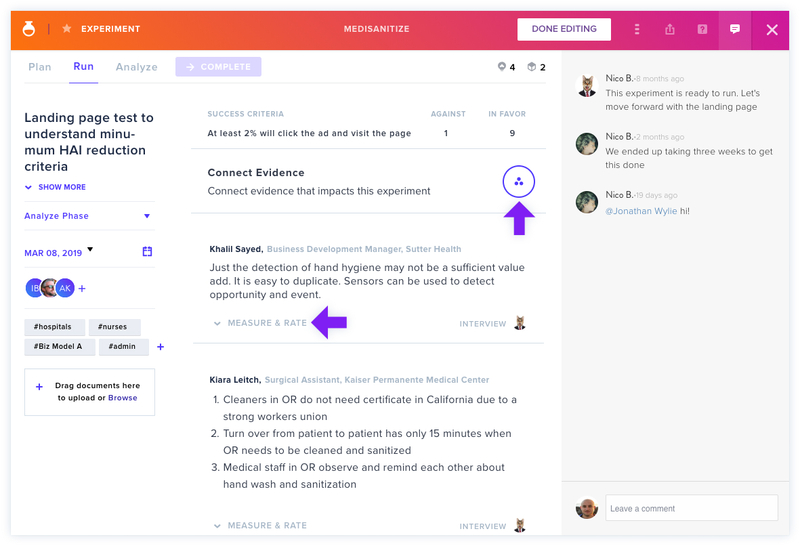 The Run phase allows you to connect or create corresponding evidence to an Experiment. To make the most of this section, get out of the building and gather the concrete data to test your hypothesis and evaluate your success criteria. Click Connect Evidence to add Evidence, or click New to create and publish new evidence), and click X to close. Next, indicate whether or not this evidence counted in favor of or against your predetermined success criteria by selecting X or ✓. If you chose to connect Ideas, rate this evidence against how confirming or disconfirming it was of your Ideas below. Ready to move on? Click Start Analysis at the top to proceed to the last phase, Analyze. Find out more about Connections in Discovery tasks here.